Motorola's next flagship smartphone now has a name, courtesy of serial leakster@evleaks. 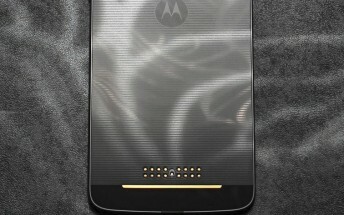 The 2017 iteration will be called Moto Z2, surprising absolutely no one. When you look at Moto's lineup and see the newly announced G5, or the G4 from last year, or theE3... you instantly realize that its devices' branding is all about using one letter and one number. The former tells you what line a model is part of (and its price range), while the latter lets you know which generation of that series you're looking at. So, second-gen Moto Z ends up being Moto Z2. That all makes sense. What doesn't is the Lenovo-owned brand's insistence of using superscript for the number part of its handsets' names, treating that digit as if it was an exponent. Quirky branding aside, there's an issue with the Moto Z2 at the moment: we know almost nothing about it. All of the recent Motorola-related leaks have been about this year's reincarnation of the Moto Xas an upper-midrange offering sitting just below the Z line in its portfolio. And the only pretty certain idea we have about the Z2 is that it will keep the modular system of its predecessor. At least that's what Lenovo was promising in 2016 - but then again, LG was also all into modularity last year and then forgot about it for the G6.